Planning the theme to any wedding can be quite tricky, if you want to have a set theme. It can be simply the color pallet you choose. Maybe you want your wedding to reflect an interest you and your husband to be share, such as a classic book, play or movie. Destinations that you love, or you and your husband to be have traveled to, or will travel to for your honeymoon, can be incorporated into your wedding theme as well. 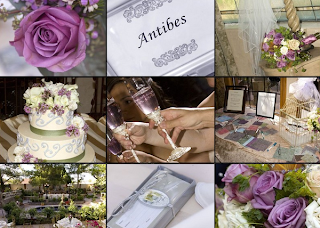 An example here is a Provence theme, which I chose for my own wedding. Not only were the colors chosen to be carried throughout the whole event, but the location of the reception was held was in the venue's Provencal Garden annex. I love the Provence Region of France. 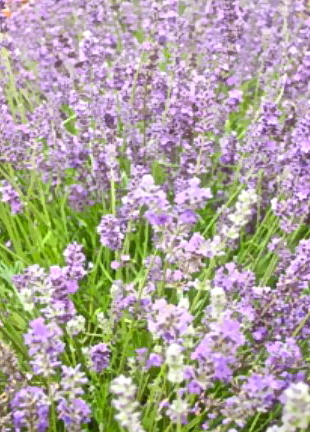 Its natural, flourishing with fields of lavender and herbs, and this venue had what I wanted. To wed in actual provence would have been unrealistic, but to bring that magic to Mesa, Arizona, it was a dream come true. The color pallet consisted of Lavender, Champagne, and Ivory, with natural touches of Sage in the greenery, and splashes of Chocolate Brown. My gown was Ivory, my bridesmaids wore Champagne. 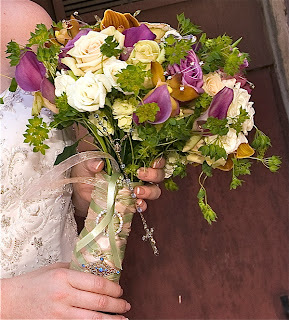 Lavender was present in the bouquets with Lavender Roses, and Lavender Mini Calla Lilies, as well Cream Roses and sprays of greenery. Also added to my bouquet were floral jewels, a family heirloom brooch with blue crystals, and a crystal blue rosary, which was draped hanging over the bouquet. Adding a splash of Chocolate came with the Chocolate Orchids, which were present in my bouquet, the bridesmaids bouquet, the flower girl bracelet, and the boutonnieres, showing unity. At the wedding reception Lavender Roses and similar hued flowers were simply placed as the centerpieces. Keeping the linens simple, I chose a cream and champagne striped top linen for the tables, with cream a simple cream linen on the bottom layer. I chose not to have adornments on the chairs, as they were simple and golden, already pleasing to my eye, and still simple. The cake was simple again, with sage ribbon on the bottom of each layer, simply piped scrolls of lavender frosting, topped with the flowers in the centerpieces. The venue, as mentioned, was Provence themed, but it was a majestic courtyard with much foliage, twinkling lights, candles in varying sizes on the tables, it was simple and elegant. To make the table names unique, I chose each table to be named after a city in Provence, such as Antibes, Avignon, Nance, etc. In lieu of placement cards, I created a list, which was framed, advising people which table they would sit at, which actually made it fun for them to say, "I'll be in Avignon", and others, "I'll be in St. Tropez". The table numbers were a DIY project I enjoyed doing. I simply bought golden/champagne hued frames, gold ink, transparent embossing powder, embossing gun, and a rubber stamp with an elegant design. Then I printed up the cities, stamped away, embossed, and assembled the frames together. It was fun to walk into the reception and see what I created set up at the tables, which people thought was an elegant touch. My guests were amazed I did this project, as they thought the venue has provided the table numbers. Since our venue was a destination minded theme, and people came from afar to attend our wedding, we provided golden luggage tags as favors, which doubled as a favor and thank you note. All can use luggage tags, and everyone appreciated this favor. Another touch, which enhanced the Provence theme, were the organza bags filled with sugar crystalized violet petals, for each guest to submerge the petals into their champagne. I had the petals imported from Provence, after being introduced to a local vendor in the city of Grasse, France, who created these little jewels, purely to add extra bubbly, a bit of sweet floral fragrance, and a touch of color to the champagne. It was such a treat to see the glasses of lavender champagne in the air as people made their toasts. Click here if you'd like to learn more about these petals, they are quite unique and rare. Whatever the theme you chose, whether a destination, a color theme, a theme from your favorite book or movie, have fun with it! Many ideas exist to inspire.